Did I get your attention with that gimmicky blog title? Let me get even more specific with my gimmick. 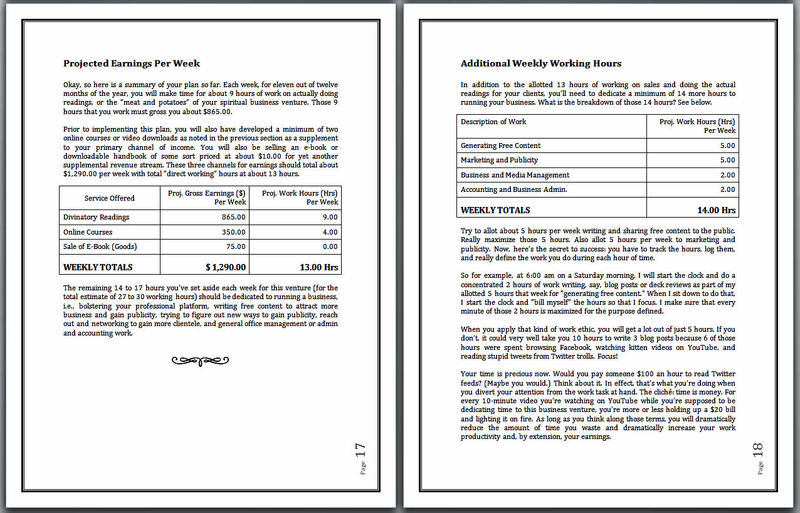 Learn how to earn $50K or more from working 27 hours per week. After being bombarded by online gurus claiming they could teach people how to earn six figures from a home business, most of them offering spiritual services, and believing that there is such a code to earning those six figures, I challenged myself to crack that code and see if I could engineer such a formula. But, I did figure out how to earn 50K, actually I contend to you more than that, from working what is essentially a 27 to 30 hour part-time work week, from home, as an entrepreneur. At least I think I did. Anyway, I’ve written up my findings. Whether you decide to go crazy and tack on 27 hours of extra work to your current working schedule to launch a spiritual service venture part-time (technically, a 27-hour work week counts as “part time”) or you’re aspiring to go full-time as a professional reader offering spiritual services and want some tips, I’ve put together a little handbook that instructs on a formula I came up with for achieving the targets I listed: $50K in earnings from a spiritual business service by putting in a 27 hour work week. Then download the handbook. I offer it in both PDF and DOC file formats. 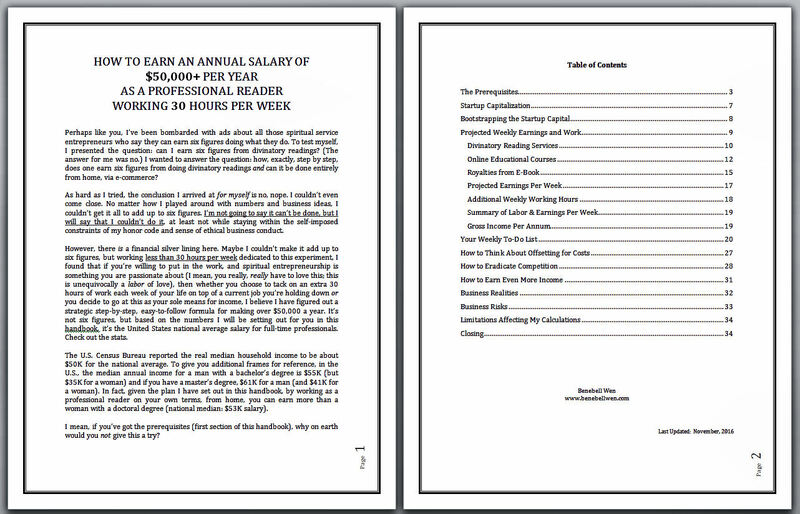 I’m pretty damn confident that the content in this download is of the same caliber as whatever those gurus are peddling in their hundreds of dollars workshops that promise you’ll be able to earn six figures. Only (hopefully) this handbook is less smarmy, more concise, to the point, and distills out all the junkie fluffy motivational crap to get to the nuts and bolts. By the way, if you’ve never donated to my site before and yet you’ve enjoyed the benefits of the many free resources provided here, consider a donation! Through your PayPal account, e-mail Jamezz52637@yahoo.com (name: James Zhang), my husband. We share the same account, though it’s under his name. You can also remit payment by e-mailing me (to benebellwen@gmail.com) an Amazon gift card in any sum, which you can order directly from your Amazon account with your credit card, by clicking here on this link. Work with me! How about a divinatory reading? Check out my reading services by clicking on the banner below. May you be good and if you are good, may you always prosper. Once again, your dedication and hard work for the tarot community astounds me. Benebell, it is truly people like you that are enriching our lives! Thank you so much for all you do.